It's finally here! We're proud to announce the new version of Smuxi, release 0.8.11 "The Line." During the development, 10 bug reports and 14 feature requests in 295 commits were worked on making this release a major feature and minor bugfix release. UI overhaul: Massively revamped menus and toolbars as designed by Georgi Karavasilev (me4oslav). Quick replies: You can now query people by clicking on their nickname. 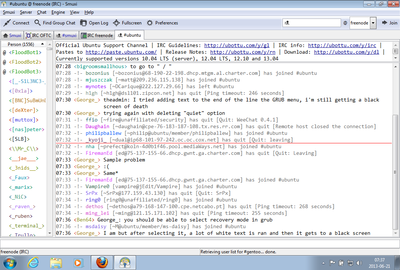 Join bar follows the current network, ctrl+x switches the network. Little things: New tab completion cycling (Ondřej Hošek), reconnect menu entry in a server tab context menu, search from the person list, better support for Emacs key bindings in GTK+ (Carlos), better Messaging Menu support for newer Ubuntu versions. 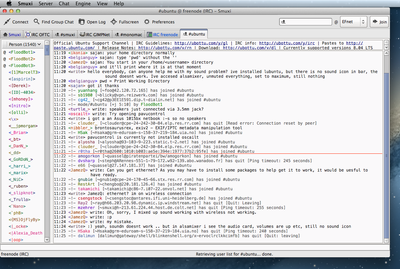 No more hanging gnome-shell for a few seconds when a notification is shown. The Windows and Mac OS X package now ship an Faenza icon theme by default. 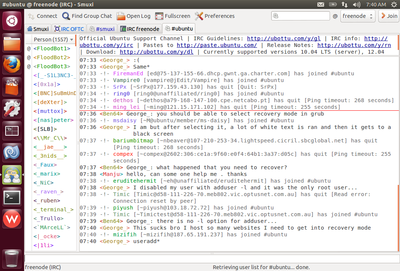 IRC URL handler: Clicking on irc:// links can bring up Smuxi. Behaviour: Smuxi has Macintosh menus (including global menu) and behaviour. Shortcuts: Smuxi has fully functional keyboard shortcuts on Mac. Font: Uses Menlo and fallbacks to Monaco font by default. Inspired by changes described here. Kudos to Jonathan Pryor and Michael Lutonsky for OS X guidance and testing! smuxi-server launch script is now included in the Mac package. Color: The navigation bar displays color for highlights, messages and events just like the GNOME frontend does. The Basics: Nickname completion, window closing, config management through a new /config command, and better Xterm detection support are all in here. 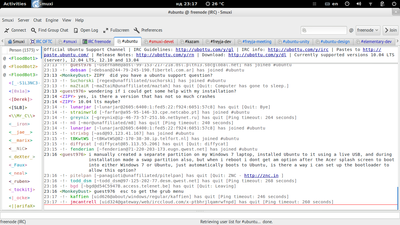 IRC, Twitter and XMPP weren't sufficient to Carlos Martín Nieto, so he added Campfire, a completely new protocol to Smuxi. Automatically opens active rooms on connect. List and search of available rooms using the Find Group Chat dialog. Optimized for laptops by reducing the CPU wakeup/s drastically which saves battery power. Added GeekShed to default networks. Travis CI: It's easy to know what broke the build as commits will be built as soon as they get pushed. Want this? Go here and grab it right now!